When it comes to space opera, most people don’t associate the genre with Africa. Not Paul Louise-Julie. He’s creating a space opera comic called Yohancé inspired by African aesthetics, culture and design. Paul noted that he’s long been inspired by Star Wars, drawing comics with his brother since childhood. With parents who collected African art and a year spend in Burkina Faso, he became fascinated with the continent’s artwork, and integrated it into his own works. In recent years, he’s authored a comic called The Pack, a fantasy about Nubian and Egyptian werewolves. When that became a bestseller, he decided that he wanted to jump into space with a new story, Yohancé. 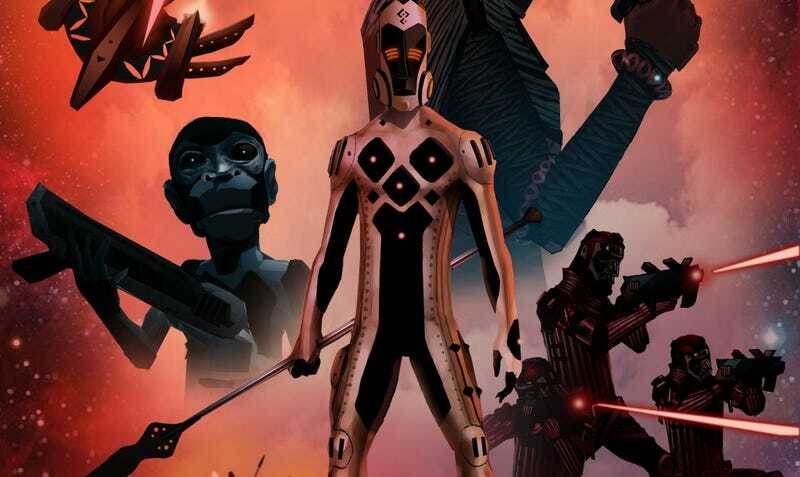 Yohancé, is described as a futuristic “space opera” inspired by ancient African cultures. How do you mesh the influences of the far past with the far future? Interestingly enough, they mesh very well. Aesthetically, traditional African art is very stylized and streamlined -important factors in futuristic design. However, the World-building on Yohance has been quite unique. I’ve had to create detailed alien civilizations while varying degrees of technological advancement - all while maintaining the design root from real African cultures. When did you first become a science fiction fan, and why did you stick with the genre? As you might have guessed, I’ve been a Star Wars fan ever since I was a kid. By adolescence, that expanded to science fiction as a whole. I love Space opera in particular because, when done right, it affects you on all fronts. You get the personal and psychological impact of story coupled with the unparalleled sense of adventure - all under the umbrella of epic mythology. The great thing about science fiction is that it materializes people’s imaginations within the suspension of disbelief. That’s why it will always be an important genre: we like to exist beyond our limitations. What first set you down on the road to create Yohancé? What particularly inspired you? I’ve actually always wanted to do a Space Opera. Even while working on The Pack, I knew that it’s the only thing I’d consider doing afterwards. It wasn’t until I saw the infamously racist reaction to John Boyega’s casting in The Force Awakens that it hit me. I realized we needed this now. That said, this goes beyond diversity. I have no interest in making a “Black Star Wars”. If this was to be done, the concept had to be unique. Simply having black characters does not make it so. In the end, I applied the same philosophy that I did on The Pack: draw inspiration from Ancient Africa and work at it until you have something original. When one typically thinks of ‘Space opera’ they think of western-derived works such as Star Wars or Star Trek. What will Yohancé bring to the genre that is currently missing? Yohancé will not only cross the barrier of ethnic diversity but will hopefully bring something fresh to the genre in both story and design. One of the unique things about Space Opera versus other types of Sc-Fi is the fact that spaceships and laser battles are merely a backdrop for geopolitical, mythological, and romantic themes. Ironically that’s what makes Star Wars so legendary because it’s not just a War amongst the Stars. That human element transcends generations and cultures. The thing with Yohancé is that will now come from Africa. The character arcs and mythology are inspired by African epics such as Sundiata Keita and Shaka Zulu that coincide with major Geo-Political events in African History. By building the characters first then letting the theatre of Intergalactic Conflict frame and influence their decisions, you get a very intricate story. What authors or artists should we look to when it comes to expanding our horizons when it comes to African science fiction and fantasy? I’ll be honest, there are only a few in my opinion that take the time to create something unique. Grey Williamson, who’s been in the business much longer than I have, recently launched his first self-published series, Val-Mar Prince of the Damned. I think the first book is stylistically perfect coupling amazing art with an intriguing story. Frankly both him and Ashley Woods from the Niobe Series are the two main Black artists to be looking at right now. Then of course there’s the legendary Brian Stelfreeze over at Marvel who is going to rock the Comic industry with the new Black Panther series in 2016. As far as writers, I have yet to read any stories that captivate me but I’m hopeful. You can follow along with Jean and Yohancé over on Facebook. Yohancé is expected to be released in March, 2016.